Presale's have ended! We will see at the Carnival 4/26 at 5pm! Punch Cards can be purchased there! Punch card packages with bonuses available only online! Carnival Presales available through 4/18/19. 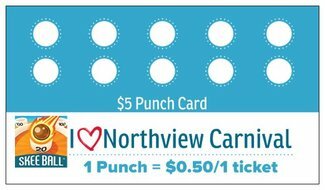 After 4/18/19, punch cards will be available only at the Carnival. Food/Games punch cards are available in a $20 card and $5 card. Raffle Basket tickets are $3/each. Family Package- $45 in punch cards, 5 Raffle Basket Tickets. *Free $5 punch card! Northview Package- $25 in punch cards, 5 Raffle Basket Tickets. *FREE Raffle ticket!